After a long day at work it can be hard to even think about opening up a book or going outside for a run. Most of us are guilty of just resorting to the television as a means of downtime. JJ Smith, author of THINK YOURSELF THIN, wants you to empower your mind and body and turn off your TV! Food for thought: Know that gossip or Ratchet TV does not feed your soul or spirit. Exercise: Someone once said that to be wildly successful, you have to put down the remote control and pick up a book. I took that advice to heart and it has never failed me. Give yourself a break from all television today, especially gossip or Ratchet TV, which does not feed your soul or spirit. Also abstain from watching the news for one day. Some folks feel like they have to continuously monitor all the disasters and heartbreak in the world as if they are in charge of grief relief. See what’s going on in the world, feel the feelings, take action, and then move on. You have to remember that love is still where you live, so focus on loving those in your life right now. We have become obsessed with consuming media, from TV to social media. We wake up and check our social media accounts and television before giving any thought to God. Break that habit and seek God first thing in the morning. Don’t be so eager to wake up to the things of this world. Instead, be eager to let God prepare your heart and mind for the day. Fill your life with God’s presence and love. Abstaining from idle entertainment might not be easy, but it’s good for your soul. I am not telling you to do so indefinitely, but for one day you should give your mind a break from meaningless noise and chatter. No TV at all today. Instead of watching television, spend the time reading about health and nutrition. This will empower you. It’s not about having some- one tell you what to eat or how much to eat, that just makes you diet-minded. It’s about learning how to help your unique body become healthier and lose weight. Enjoy learning, reading, and growing in knowledge. Be empowered, for knowledge is power. Turn off your television and pick up a copy of THINK YOURSELF THIN by JJ Smith! Excerpted from Think Yourself Thin by JJ Smith. Copyright © 2018 by author. Used by permission of the publisher. All rights reserved. The author of the #1 New York Times bestseller 10-Day Green Smoothie Cleanse returns with this revolutionary guidebook filled with the crucial mental strategies that will provide the missing piece in your weight loss journey once and for all. After helping dieters lose over two-million pounds in two years, JJ Smith realized the most important, yet most overlooked, factor for permanent weight loss is mental mastery. 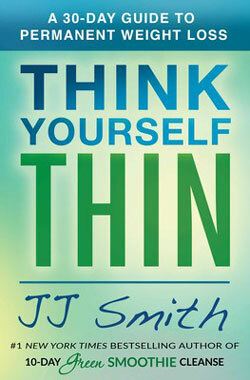 In Think Yourself Thin, Smith helps you uncover the root of your struggle and address the spiritual or emotional issues tied to your eating behavior. By applying the strategies outlined in this book, you will have the tools you need to take control of your weight, and thus your health, and experience the joy of having your dream body. Divided into four parts, Smith’s book uncovers the five psychological stages required to lose weight and keep it off. Smith also introduces the all-new SUCCESS System detailing the mental habits and approaches necessary for permanent weight loss. Filled with inspiring, motivational success stories and user-friendly principles that provide the guidance you need to eat in a manner that helps the body burn fat and lose weight, Think Yourself Thin makes long-term weight loss a reality by starting with what matters most.